What a blessing to come of age in an era before the Internet and then learn to embrace life today with its constant communications and endless access to information. The biggest excitement for me as a marketer is realizing that all of the tools available to us online can only help build relationships, and that’s ultimately what we’re in the business of doing. The technology behind it all is really just the vehicle. So, whether it’s live-tweeting an event, posting a microsite or finding a new use for a favorite technology, I savor every chance to expand horizons online. 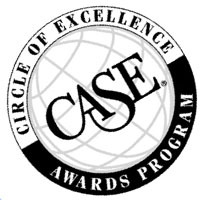 It’s hard to pick one favorite project in what I’ve done throughout my career, but being the co-leader of a project that won a CASE Silver Award (“Innovative Use of Technology,” 2013) probably comes pretty close, and does being recognized as a “stellar speaker” at the CASE District I / II conference in 2012. Writing a cover story for CASE Currents about effective e-mail segmentation (“Give Them What They Want” – May/June 2012) was a thrill too! More recently, let’s not forgot the excitement of rolling out a 1,000-person Cloud-based Intranet with my team, which allows internal communication and collaboration to reach new heights.